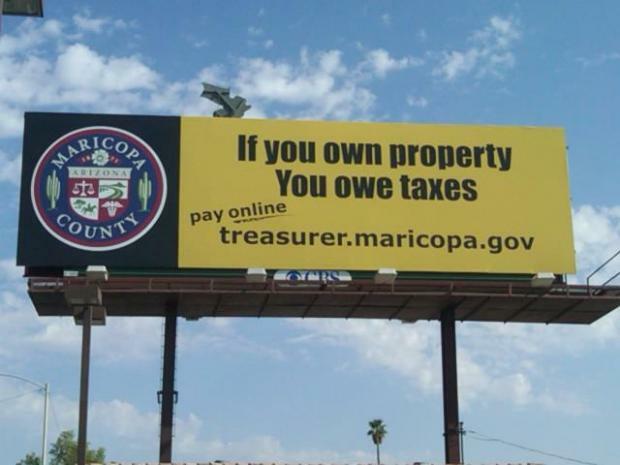 If you Own Property... You Owe Taxes! 7 Comments in Response to If you Own Property... You Owe Taxes! I did not need permission to be born in the US as in China, or a license to get born as this came from God. I do not need a license to work in order to eat or feed my family, this too came from God, like water, free air, and free food on the ground. I do not have to pay taxes to strong armed, robber-baron, politicians, who make laws, in order to steal from us and to live off of our labors, our time and our efforts. Who made them king? They are not my boss. I do not need a license to kill these evil bastards from trying to be my slave master. I do not need a license to die either. They have no God-given right, authority, or power over me or my actions for self defense or family support, children's educations, or flu vaccinations. Only We the People allow these Illuminati Banksters to thrive and enslave us with our permission. Duh? Can their asses collectively. Each state is a Sovereign State, a country into itself. The Feds only have power from the many States as a whole, not over Individual States or Individuals. The Feds have power to conduct war and business with other nations and to conduct business with each state among all the states. They have no power over any individual state or Sovereign Individual. They cannot pass ID Acts to limit our work, our trade, our barter, or our medium of trade such as money, as silver and gold will do nicely. They have over-reached and usurped the powers given them in the US Constitution, Article 1, Section 8, and stolen from the Sovereign States and Sovereign Individuals the fruits of our labors. They will pay dearly for this. donate, gather signatures and DO something about it. You don't 'own' a property if you must pay a tax on it, the Government owns the property. Don't believe that? Don't pay your property tax and see what happens to 'your property'. If you buy property with fed notes and are a citizen (aka taxpayer) with a taxpayer identification # (aka social security #) or if you buy your property from a state run business (aka corporation) you owe taxes. A fed note is not property; it is an obligation of the Federal Reserve. If you buy property with property from a non-corporate entity there are no taxes due. If you were referring to land then you owe rent to the owner of the land (aka the US government) it is not, however, a tax on property. They own the land and if you don't want to pay your rent... well you know the rest of the story. Obviously there are more caveats than this, but you get the general idea.